The first Spaceballs jersey was intended as a joke for my Facebook page, I threw it together pretty quickly and as such it was a very sparse design; however demand was so overwhelming it was offered almost immediately. For the 2.0 design I thought I’d put together something a little more in keeping with the other hockey jerseys I post here. The “Dark Helmet headbust over Spaceballs text” was a recurring look in the film, so I went with that for the main logo. This design is for your consideration, so please like, comment, or share to let me know if you want this to replace the first design. There’s a strong likelihood of an offer happening soon (whether it’s this design or the old one), so feel free to sign-up for it here as well. Posted on February 17, 2015, in Geeky Jerseys, Hockey Jersey Design and tagged davesgeekyhockey, Films, Geeky Hockey Jerseys, good is dumb, Hockey Jersey Design, Logo design, schwartz, SPACEBALLS. Bookmark the permalink. 9 Comments. Your original design is perfect. It’s so post modern and self referential. This second design takes away from that simplicity. I truly hope you go w a design closer to the original. 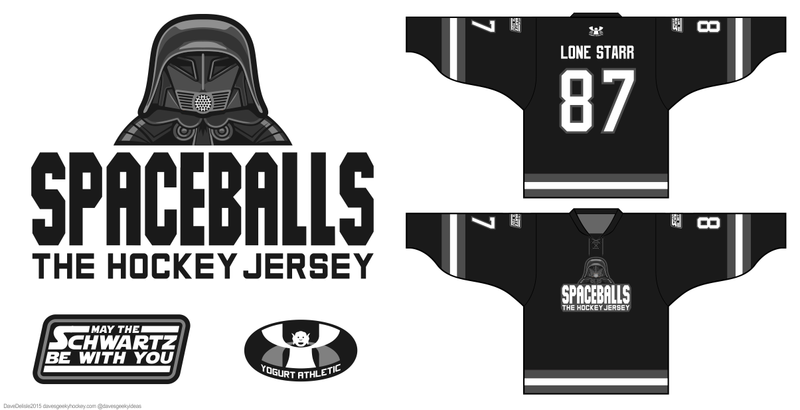 I would be extremely happy with either version of the space balls hockey jersey. However, I do like the original design better. The new one is way better. The original one just had one logo, which is good, but it was kinda practice jersey-ish. The original design is good, but a little subtle. Given how “over the top” Mr. Brooks went in the movie, I think that the new design is more in keeping with the spirit of the movie! Love the updates to this design. Nice details that really bring it all in! Totally would be in for buying one if this gets printed. Awesome stuff. I think I still lean towards the original Spaceballs jersey. It was a simpler, more direct marketing cash-in (which in this case makes it better reflect the source material.) Designing a Spaceballs jersey nice or attractive to stand on its own merits defeats the purpose of a Spaceballs jersey! It would be a sacrilege, like making Los Pollos Hermanos classy and understated. The original I think is better and more subtle. However, I am a fan of giving props to Lord Helmet instead of Lonestarr. Either way I hope either goes into production. I love the original but add the shoulder patches and yogurt armor patch to it to complete the look. Otherwise the shoulders are a bit barren.